US officials responsible for the secret CIA drone campaign against suspected terrorists in Pakistan may have committed war crimes and should stand trial, a report by a leading human rights group warns.Amnesty International has highlighted the case of a grandmother who was killed while she was picking vegetables and other incidents which could have broken international laws designed to protect civilians. The report is issued in conjunction with an investigation by Human Rights Watch detailing missile attacks in Yemen which the group believes could contravene the laws of armed conflict, international human rights law and Barack Obama’s own guidelines on drones. The reports are being published while Nawaz Sharif, Pakistan’s prime minister, is in Washington. Sharif has promised to tell Obama that the drone strikes – which have caused outrage in Pakistan – must end. Getting to the bottom of individual strikes is exceptionally difficult in the restive areas bordering Afghanistan, where thousands of militants have settled. People are often terrified of speaking out, fearing retribution from both militants and the state, which is widely suspected of colluding with the CIA-led campaign. There is also a risk of militants attempting to skew outside research by forcing interviewees into “providing false or inaccurate information”, the report said. But Amnesty mounted a major effort to investigate nine of the many attacks to have struck the region over the last 18 months, including one that killed 18 labourers in North Waziristan as they waited to eat dinner in an area of heavy Taliban influence in July 2012. All those interviewed by Amnesty strongly denied any of the men had been involved in militancy. Even if they were members of a banned group, that would not be enough to justify killing them, the report said. “Amnesty International has serious concerns that this attack violated the prohibition of the arbitrary deprivation of life and may constitute war crimes or extrajudicial executions,” the report said. It called for those responsible to stand trial. The US has repeatedly claimed very few civilians have been killed by drones. It argues its campaign is conducted “consistent with all applicable domestic and international law”. 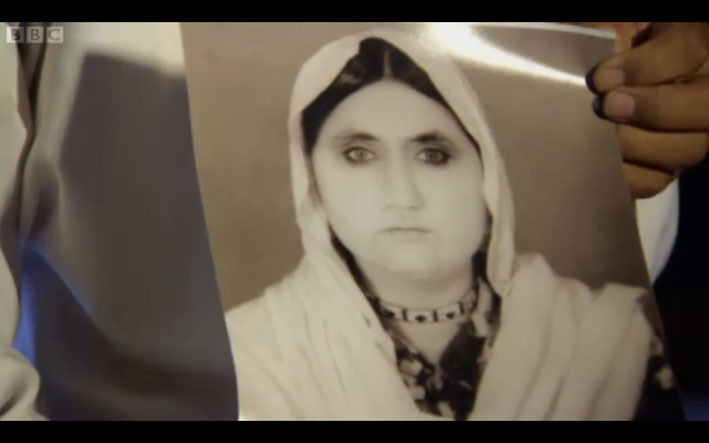 The Amnesty report supports media accounts from October last year that a 68-year-old woman called Mamana Bibi was killed by a missile fired from a drone while she was picking okra outside her home in North Waziristan with her grandchildren nearby. A second strike minutes later injured family members tending her. If true, the case is striking failure of a technology much vaunted for its accuracy. It is claimed the remote-controlled planes are able to observe their targets for hours or even days to verify them, and that the explosive force of the missiles is designed to limit collateral damage. As with other controversial drone strikes, the US has refused to acknowledge or explain what happened. Amnesty said it accepts some US drone strikes may not violate the law, “but it is impossible to reach any firm assessment without a full disclosure of the facts surrounding individual attacks and their legal basis. The USA appears to be exploiting the lawless and remote nature of the region to evade accountability for its violations,” it said. In Yemen, another country where US drones are active, Human Rights Watch highlighted six incidents, two of which were a “clear violation of international humanitarian law”. The remaining four may have broken the laws of armed conflict because the targets were illegitimate or because not enough was done to minimise civilian harm, the report said. It also argued that some of the Yemen attacks breach the guidelines announced by Obama earlier this year in his first major speech on a programme that is officially top secret. For example, the pledge to kill suspects only when it is impossible to capture them appears to have been ignored on 17 April this year when an al-Qaida leader was blown up in a township in Dhamar province in central Yemen, Human Rights Watch said. An attack on a truck driving 12 miles south of the capital Sana’a reportedly killed two al-Qaida suspects but also two civilians who had been hired by the other men. That means the attack could have been illegal because it “may have caused disproportionate harm to civilians”. The legal arguments over drones are extremely complex, with much controversy focusing on whether or not the places where they are used amount to war zones. Amnesty said some of the strikes in Pakistan might be covered by that claim, but rejected a “global war doctrine” that allows the US to attack al-Qaida anywhere in the world. “To accept such a policy would be to endorse state practices that fundamentally undermine crucial human rights protections that have been painstakingly developed over more than a century of international law-making,” the report said. Publicly disclose the facts and legal basis for drone strikes carried out in Pakistan and information about any investigation into killings by US drones. Ensure prompt, thorough, independent and impartial investigations into all cases where there are reasonable grounds to believe that drone strikes resulted in unlawful killings. Bring those responsible for unlawful drone strikes to justice in public and fair trials without recourse to the death penalty. Ensure that victims of unlawful drone strikes, including family members of victims of unlawful killings, have effective access to justice, compensation and other remedies. Provide adequate access to justice and reparations for victims of US drone strikes and attacks by Pakistan forces, and seek reparations and other remedies for drone strikes from the US authorities. Bring to justice, in fair trials without recourse to the death penalty, individuals responsible for unlawful killings and other human rights abuses in North Waziristan. This should include US drone strikes, attacks by the Pakistan armed forces, or groups like the Taliban and al-Qa’ida. Publicly disclose information on all US drone strikes that the Pakistani authorities are aware of, including casualties and all assistance provided to victims. Oppose US drone strikes and other killings that violate international law and urge the USA and Pakistan to take the measures outlined above. States should officially protest and pursue remedies under international law when lethal force is unlawfully used by the USA or other states. Refrain from participating in any way in US drone strikes that violate international law, including by sharing intelligence or facilities. Why Was this Grandmother Killed by a Drone?